The Transportation Safety Board of Canada spent four years working on an air-taxi Safety Issues Investigation to address persistent issues. The Transportation Safety Board of Canada in 2015 launched a Safety Issues Investigation into the risks – and underlying safety issues – of domestic air-taxi operations. The research is based on 15 years of data from a range of sources not exclusive to TSB’s own investigations and the Civil Aviation Daily Occurrence Report System (CADORS) overseen by Transport Canada, as well as 17 previously existing studies produced by various agencies dating back to 1990. Air-taxi operators, as defined by Canadian Aviation Regulations (CARs) Part 703, hold no more than single- and multi-engine aircraft (other than turbojet) with a maximum certificated take-off weight of 19,000 pounds, or less, and a seating configuration of nine, or less – excluding pilot seats. As a key segment of Part 703, helicopter operator statistics, as well as accident types and themes, were broken out in the Safety Issues Investigation (SII), but ultimately presented as part of the entire air-taxi sector. In launching the SII program, the Transportation Safety Board (TSB) announced Part 703 deaths represented 62 per cent of all commercial aviation fatalities over the 15 years measured (2000 to 2014). The SII, according TSB, aims to address Part 703 issues that have not been sufficiently mitigated with the ultimate goal of taking action to reduce what Canada’s transportation watchdog describes as persisting risks. Based on its earlier investigations into Part 703, TSB notes there are multiple recurring issues to address, including areas like pilot experience and training; ineffective pilot decision making (PDM)/crew resource management (CRM); crew adaptations from standard operating procedures (SOPs); inadequate risk analysis of operations; operational control; organizational factors; and Transport Canada oversight. 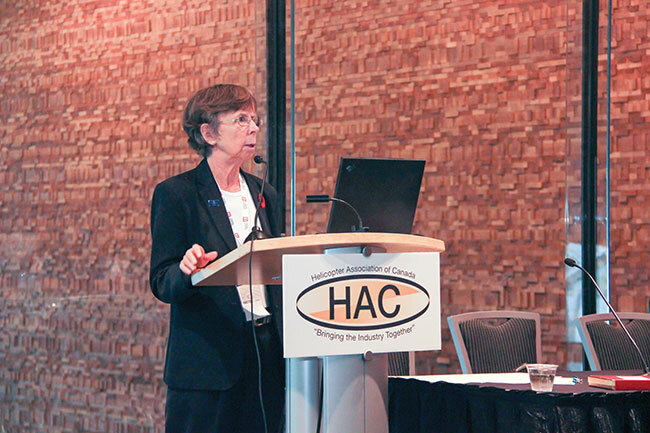 TSB chair Kathy Fox at the Helicopter Association of Canada conference in mid-November 2018 presented preliminary findings of the air-taxi SII, which included 11 common factors of all Part 703 accidents. She began her presentation showing bar graphs of accidents and fatalities from 2000 to 2017 involving Canadian registered aircraft by operator type, including CARs Parts 702 up to Part 705 used to define the airline segment. “Air taxi sticks out like a literal soar-thumb in terms of the total number of accidents, and also the total number of fatalities,” Fox says. She is quick to point out how TSB does not have the underlying activity rates of Part 703 operators, meaning the research team did not have specific takeoff and landing totals, or number of hours flown. Fox also explains some operators have multiple certificates allowing them to report against the highest type they hold. As a result, TSB cannot determine the air-taxi sector accident rate, which has gone down in total numbers. Fox also notes a decrease in the total number of Part 703 operators. Fox reiterates the air-taxi SII is based on a data samples from 2000 to 2014, because the research team decided to focus on closed investigations. Fox presented the additional three years – 2015 to 2017 – to illustrate how air-taxi accidents and fatalities are still sticking out from other sectors. During the industry consultation phase of the SII, TSB also produced more than 300 hours of testimony, based on approximately 125 interviews from 32 operators and Transport Canada inspectors. This included a range of single-pilot and multi-crew operations, involving seaplanes, helicopters, VFR, IFR, medivacs, and more. This resulted in the SII focusing on 19 accident themes, which TSB differentiates from accident types. Fox explains TSB is planning to convene aviation stakeholders – operators and authorities – in fall 2019, which also happens to be the mid-way point of its biannual Watchlist, with the fifth edition being released in late-October 2018. Among seven key safety issues identified on the 2018 Watchlist, three multimodal issues affect aviation, including safety management and oversight, slow progress addressing TSB recommendations, and fatigue management. The risk of collisions from runway incursions and runway overruns were the two key Watchlist issues specific to aviation.